1996 Jetta:The Boy and I have just about recovered from last Thursday’s car accident fiasco. My ’96 Jetta was indeed deemed totaled. And yes, I sat in it one last time and cried a little bit. Because I am way too emotionally involved with inanimate objects. 2002 Jetta: So I bought my new car this morning. It’s lovely. 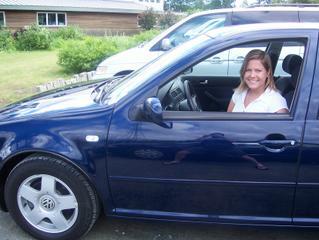 A 2002 Jetta GLS in Dark Blue. Hot little car. I like it. If you look at the reflection in my car door, you can see my handsome boyfriend in some kind of weird ninja stance, taking the picture. Thanks to my friends and family: I need to thank my Mom, my Dad, Grambo, The Boy and Batman for their help this week. Without them in my carless week, I would have had a nervous breakdown at the accident scene, I would have never made it to work, and I couldn’t have made the New Car purchase so quickly and painlessly. I mean, people were treking me all over the place. Without complaining. And without taking any money for gas from my grateful self. So THANK YOU to everyone for your help. 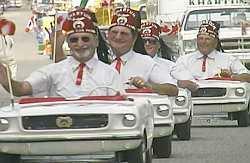 I’d be fired from my job and possibly renting a Shriner car as a method of transportation. I’m off to the beach tomorrow. In my new car. Ah… sometimes it’s just so sweet. Goodnight, Jetta. Don’t Buy a VW Clouding on the Road. A Bad Year for Goodyear.